Day 1: Ahmedabad: Check into a hotel on arrival in Ahmadabad, largest city of Gujarat. Located on the banks of River Sabarmati, Ahmadabad is the hub of trade and commerce in Gujarat. Set out to explore the city after some relaxation. Visit Sabarmati Ashram, home of Mahatma Gandhi till 1930. This gives a wonderful insight into where Gandhiji lived and how he might have carried on things from there. 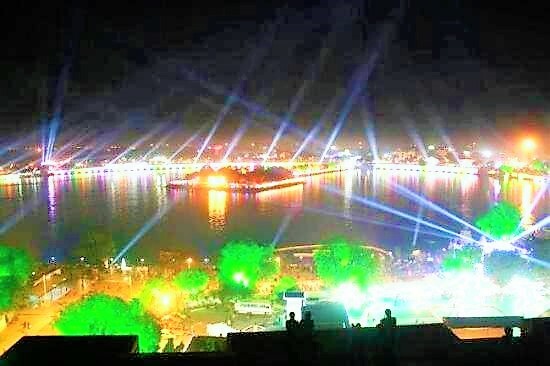 Afterwards, go and visit Kankaria Lake, located on the south eastern side of the Ahmadabad city. Built in 1451 by Sultan Qutab-ud-Din, Kankaria Lake is a nice place to relax. A beautiful garden called Nagina Wadi lies adjacent to the lake. You can also go on to visit Sardar Patel National Memorial. Ahmadabad has a lot of medieval period monuments as well. These include Teen Darwaza, Bhadra Fort, Jhulta Minar, Jama Mosque, Sarkhej Roza among others. One can go and visit these. Have dinner at one of the city restaurant. Overnight in Ahmadabad. Day 2: Ahmedabad – Bhavnagar: Check out in the morning and drive to Bhavnagar, a drive of around five hours. Check into a hotel on arrival in Bhavnagar. After some relaxation go on to explore Bhavnagar. Visit Takhteshwar Temple, a historic temple located on a small hill. This temple provides good views of the city and the Gulf of Cambay. Go on to visit Nilambagh Palace, which has been converted to a heritage hotel now. Barton Museum is also something all tourists must go. Those interested in wildlife can go and visit Victoria Park. You are going to see hyenas, blue bull, antelopes, and jackals. Visit Alang, which is an interesting and unusual place to visit. This is India’s largest ship breaking site, where supertankers, container ships, warships and other vessels are dismantled by hand by over 20,000 people working day and night. Return to the hotel. Have dinner. Overnight in Bhavnagar. Day 3: Bhavnagar – Diu: Check out from the hotel in Bhavnagar and drive to Diu, a Union Territory – a nearly five hour drive. Check into a hotel on arrival in Diu. Diu, which lies towards the southern coast of Kathiawar Peninsula of Gujarat at the mouth of Daman Ganga River, is known for its fortress and Old Portuguese Cathedral. After some rest go out to explore Diu. One should start with Nagoa Beach, one of the cleanest beaches in Diu. Go and enjoy water sports at the beach. There are other beaches in Diu as well. One can go and enjoy at the Ghogla Beach. You can indulge in paragliding and also go for swimming and sunbathing. Chakratirth Beach and Jallandhar Beach are other nice beaches in Diu one can explore. Have dinner at one of the restaurants. Overnight in Diu. Day 4: Diu: Embark on a full day excursion of Diu after a hearty breakfast. Start the day with a trip to Diu Fort. The fort was built by the Portruguese in 1535 subsequent to a defense alliance forged by Bahadur Shah, the Sultan of Gujarat and the Portuguese when Humayun, the Mughal Emperor, waged war to annex this territory. The entrance gateway to the fort has an inscription in Portuguese. The Fort commands a nice view of sea. From the fort a glittering view of the Panikotha Fort located in the sea, off the coast opposite to Diu Fort, can be seen. There are several cannons still seen at the top of the Diu Fort. There are three churches within the fort. These are St. Paul’s Church, St. Thomas Church and Church of St. Francis of Assisi. St. Paul’s Church was built between 1601 and 1610 in the colonial Portuguese Baroque style. St. Thomas Church is one of the few churches in India that boasts of Gothic style architecture. After a visit to Diu Fort go on to explore Naida Caves, located outside the city wall of the Diu Fort. Also go on to visit Gangeshwar Temple, which is a small temple. There are five Shiva lingas, which are supposed to have been established by the Pandavas. These lingas are washed by sea water during high tides. Sea water gushes in, and washes them every day. Return to the hotel, and have dinner. Overnight in Diu. Day 5: Diu – Somnath: Check out after breakfast and drive for two hours to reach Somnath, a coastal town famous for its temple – Somnath Jyotirlinga Temple. Check into a hotel on arrival in Somnath. Immediately after some rest head out to explore what Somnath has to offer. Visit Somnath Jyotirlinga Temple, first of the 12 jyotirlingas in India. This is situated near the beach. The temple has a history and is said to have been attacked and razed to the ground by Mahmud Ghazni. Ahilyabai Holkar constructed a temple at Somnath in 18th century. This is still present. Later, Sardar Patel helped build a temple in 1951 on the original site where temple was razed to the ground by invaders. Go for light and sound show at the temple in the evening too. Also go and visit Bhalka Tirth, which is said to be the place Lord Krishna left the world. This is also located near Somnath Jyotirlinga Temple. Aarti in the evening is worth seeing. 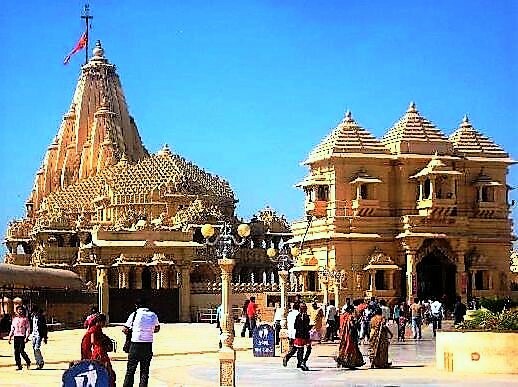 There are other temples in Somnath and you can visit those. Go and visit Prabhas Patan Museum, situated close to the main Somnath Jyotirlinga Temple. It gives detailed information about the temple and its history. Enjoy the views of sea and have dinner. Overnight in Somnath. Day 6: Somnath – Gir: Check out from the hotel in Somnath after breakfast and drive for nearly two hours to reach Gir, the only home in India for Asiatic lions. Check into a resort on arrival. Have some rest and take lunch. Visit Devalia Safari Park, also known as Gir Interpretation Zone in the afternoon. The basic aim of creating this facility is to provide an opportunity of viewing lions and all other fauna species found in Gir Forest in their natural habitat within a short period of time. Take a safari to see these. You can see animals like Asiatic lions, Leopards, Blue Bull, Sambhar, Chital, Jackal, Black buck, Wild Boar among many others. Some rare birds are also found in Devalia along with the common ones like Peafowl and vultures. Return and have a leisurely evening. Enjoy a nice dinner at the resort. Overnight in Gir. Day 7: Gir: Get up very early in the morning and head to the forest for a safari. Take an open jeep and venture into the forest along with a forest guide. Be sure to click animals in their natural habitats. Keep an eye on birds, leopards and other animals. Asiatic lions are shy animals but because of living in close proximity to human settlements lions in Gir have become used to their presence. Return from the forest after a joyful safari. Have breakfast and have leisure till it is time for afternoon safari which begins around 3pm. Enjoy the afternoon safari and see how animals behave at different times of a day. Have a nice leisurely evening. Overnight in Gir. Day 8: Gir – Porbandar: Check out from the resort after breakfast and drive to Porbandar – a drive of around 4.5 to 5 hours. Check into a hotel on arrival in Porbandar. Porbandar is a coastal city on the west coast of Gujarat, famous for being the birth place of Mahatma Gandhi. Go and visit Kirti Mandir, the birth place of Mahatma Gandhi. The place is well maintained with a good collection of things associated with Gandhiji. Also visit Kasturba’s home which is near to Kirti Mandir. Afterwards go and visit Porbandar beach. This is a good beach for those who love swimming. Changing rooms for both genders are there on the beach. So you can hit the sea and enjoy. After this, towards the evening, visit Shri Hari Mandir and attend the evening aarti. Return to the hotel and have dinner. Overnight in Porbandar. Day 9: Porbandar – Dwarka: Check out from the hotel and start for Dwarka, Lord Krishna’s city. On the route, close to Porbandar itself, visit Harsiddhi Mataji Temple, situated on a small hillock. It is said to be an ancient temple. Have breakfast afterwards and resume journey to Dwarka. Reach Dwarka after a drive of a little more than two hours. Check into a hotel on arrival. Go and visit Gomti Ghat, the place where River Gomti meets Arabian Sea. The banks are a nice place to spend time. Feed the fish buying fish feed. You can go for boat rides. Afterwards, go and visit Bhadkeshwar Mahadev Temple. This is a unique temple as one can reach temple only during low tide. During high tide the pathway to the temple is submerged under water. Sunset from here looks amazing. Swaminarayan Mandir and ISKCON Temple are lovely places to visit in Dwarka. Have dinner in the evening. Overnight in Dwarka. Day 10: Dwarka: Get up early in the morning and visit Dwarkadhish Temple for Managala Aarti. The main shrine of the 5-storied building of Dwarkadhish Temple, also known as Jagat Mandir, is supported by 72 pillars. According to some archaeological findings, the temple is supposed to have a origin of over 2000 years old. The temple is said to have enlarged in the 15th-16th century. After this go and visit Meerabai Temple, located quite close to Dwarkadhish Temple. Proceed afterwards towards Nageshwar Jyotirlinga Temple, situated 20km from Dwarka on the route to Beyt Dwarka. This is one of the 12 jyotirlingas. It has a huge 25 meters Shiva statue in sitting position and a large garden with a pond at the entrance. Beyt Dwarka, the place where Lord Krishna is supposed to live, is another place all visitors should go. This is on an island which can be accessed only by a boat. Return and visit Gopi Talav and Rukmini Temple. Day 11: Dwarka – Jamnagar: Check out from the hotel in Dwarka and drive to Jamnagar after a drive of around 3.5 hours. Check into a hotel on arrival in Jamnagar. Jamnagar is dotted with several Hindu and Jain temples, the most important ones being the ancient Sun Temple and Bal Hanuman Temple. Important Jain temples include Vardhman Shah’s Temple, Raisi Shah’s Temple, Vasupujya Swami’s Temple and Sheth’s Temple. Darbargadh Palace and Pratap Vilas Palace are fine examples of Rajput styles of architecture. The city has rich culture and many remnants of the past preserved in the form of forts and palaces that have been maintained even today. The Lakhota Palace and Museum along with Bhujio Khoto are some more places you must visit. Willingdon Crescent is also something all tourists must visit. Have dinner and retire to your room. Overnight in Jamnagar. Day 12: Jamnagar – Bhuj: Check out from the hotel in Jamnagar and drive to Bhuj. This is a drive of around five and half hours. Check into a hotel on arrival in Bhuj. Go and visit Kutch Museum, situated right at the center of the town. The oldest museum in Gujarat, founded in 1877 by Maharao Khengarji. Kutch Museum, though small, has the largest existing collection of Kshatrapa inscriptions, dating to the 1st century AD. The Museum has examples of now extinct extinct Kutchi script. Look at the collection of the coins in the museum. Different aspects of history, art and craft are displayed in the Museum. Situated close to Kutch Mahal is Hamirsar Lake, a man made lake named after Rao Hamir, founder of Bhuj. Spend some time here. Walk along the lake to reach Aina Mahal, an 18th-century palace in Bhuj. Built by Rao Lakhpatji in 1761, Aina Mahal is located next to the Prag Mahal. Built by Rao Lakhpatji in 1761, Aina Mahal is a two-storied building with a Hall of Mirrors as the main attraction along with the Darbar Hall (King’s court), Hira Mahal (King’s Bedroom), and Fuvara Mahal. The grandeur of interior architecture and designs of is amazing. There are different rooms having items used by Kings and Queens of Bhuj. Have dinner in the evening at one of the restaurants. Overnight in Bhuj. Day 13: Bhuj: After an early breakfast set out to explore those areas of Bhuj which are far off. Go and explore White Desert. This is a salt desert. It is a unique place to visit with no parallels in India. Include Kalo Dungar as part of the trip. Kalo Dungar is the highest point in the Kutch White Desert offering awesome views. Dattatreya temple is right there. Return after a full day trip to these places in the Great Rann of Kutch. In the evening one can visit the ever beautiful and spiritual Swami Narayan Temple. Have dinner at one of the restaurants. Overnight in Bhuj. Day 14: Bhuj – Onward destination: Check out after breakfast. Go to the airport to catch a flight to Mumbai from where you can fly to your desired destination. Treat yourself to customized tour packages with Excursion2India!